Weightlifter's shoulder is a painful deterioration of the distal end of the clavicle (collar bone). It is an overuse phenomenon that causes tiny fractures along the end of the clavicle. A breakdown of the bone (osteolysis) occurs. Weightlifters aren't the only ones affected. Female bodybuilders, air-hammer operators, soldiers, handball players, and others can develop this problem. For that reason, it is also known as distal clavicular osteolysis (DCO). Osteolysis refers to the resorption of bone at the site of the injury. The acromioclavicular (AC) joint is affected most often. This is where the end of the collarbone (closest to the shoulder) attaches to the acromion. 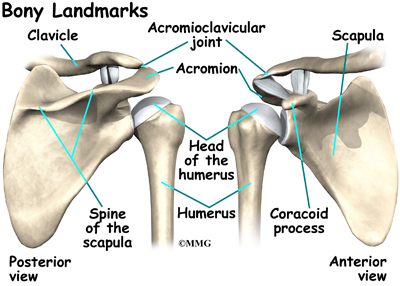 The acromion is a curved piece of bone that comes from the shoulder blade across the top of the shoulder. The clavicle and acromion meet to form the AC joint in front of the shoulder. Ligaments and soft tissues hold the AC joint together and provide stability. These include the coracoclavicular ligament, superior and inferior AC ligaments, and the AC joint capsule. There is also a fibrocartilaginous disc between the clavicle and acromion to provide cushion and help transmit and offload forces on the joint. 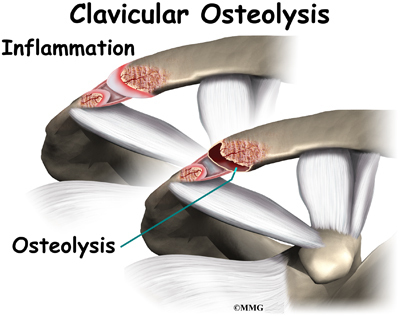 Repetitive trauma or stress from training and lifting causes tiny fractures of the distal end of the clavicular bone. Excessive traction on the AC joint from bench presses or chest fly exercises occurs when the elbows drop below or behind the body. This places the shoulders in a position of excess extension. Because the bone doesn't have a chance to heal before the next training session begins, the bone actually starts to dissolve. There may be a history of an acute injury of the AC joint. But the condition can occur without any known trauma. In most cases, there is repetitive stress to the affected upper extremity. 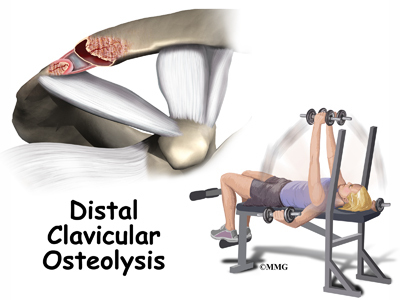 Weight training, intensive lifting, and operating an air hammer are examples of the activities leading to acute distal clavicular osteolysis. There is evidence that the body tries to heal itself but the bone dissolves or is resorbed by the body instead. A network of blood vessels forms in the area during the attempted healing process. Chronic inflammation with scar tissue called fibrosis is commonly found when tissue from the area is examined under a microscope. The synovial lining of the joint starts to overproduce itself. Invasion of the underlying bone begins. Degenerative joint disease occurs as an end-result of the pathologic process. You feel an aching pain in the front of the shoulder at the AC joint. Pressing on the AC joint causes increased pain and tenderness. There is often weakness associated with the degenerative bone changes. For the weightlifter, symptoms are the most severe the night after a weightlifting competition or program. Moving the arm across the body hurts. It gets worse with weight training involving the upper extremities (arms). Activities such as push-ups, bench presses, power clean exercises, dips on the parallel bars, and throwing motions make the symptoms worse. . Lying on the affected side can disrupt sleep. How will my doctor diagnose this condition? The history and physical examination are probably the most important tools the physician uses to diagnose. Your doctor may move and feel your sore joint. This may hurt, but it is very important that your doctor understand exactly where your joint hurts and what movements cause you pain. The diagnosis is made using X-rays, scintigraphy (bone scan), and steroid injection. CT-guided injection is actually a diagnostic tool and a treatment. Pain relief with steroid injection into the AC joint confirms that the pain is coming from the AC joint. Treatment begins with conservative (nonoperative) care. This may include rest and/or changes in weight-training activities and techniques. Avoiding over-training and smoking are two very effective ways to prevent this condition. If it does develop, take quick steps to modify weightlifting techniques and avoid over-training. A weight-trainer or physical therapist can help you with activity modification and specific strength training for this problem. For example, you can narrow your hand spacing on the barbells. This takes the stress off the distal clavicle. End your bench presses two inches above the chest. Some lifters place a two-inch folded towel on the chest as a reminder. The power clean or power jerk can also be modified. Don't rack the bar. Start with the elbows even with or above the shoulders and lift. This eliminates the power pull. 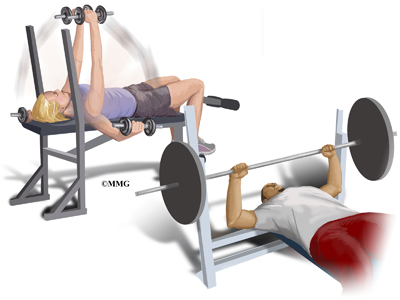 Certain activities such as the bench press, dips, and push-ups should be avoided for a while. Apply an ice massage and take ibuprofen after each workout or exercise session. Athletes must be careful to follow all recommendations for program modifications. There is a tendency to work through the pain and not really modify the program. Surgery may be needed for those athletes who do not improve with conservative care or who are unwilling to change the training or performance routine. The surgeon removes the end of the clavicle. 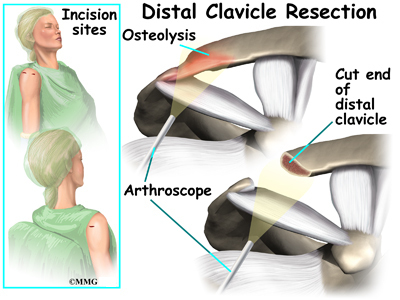 This is called a distal clavicle resection. The procedure can be done with an open incision or through tiny puncture holes with an arthroscope. Repair of any torn soft tissue in the area is done at the same time. Some surgeons transfer the coracoacromial ligament over the end of the bone that has been cut. This helps stabilize the joint. It's possible to modify the procedure just a bit to stabilize the joint for a quick return-to-sport. 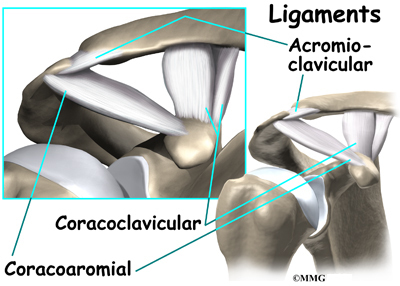 The coracoacromial ligament can be transferred over the end of the bone that has been cut. This helps protect and stabilize the joint. It makes power lifting more comfortable for many athletes. You may experience a gradual lessening of painful symptoms until you are pain free. The therapist will help you gradually resume all activities without bringing back the problem. For athletes who progress through the pain without activity modification, they may perform surgery on themselves. In this form of self-surgery, the clavicle will resect on its own. However, there may be an inflammatory response with increased symptoms setting you back in your program. Many experienced weightlifters are able to continue training carefully. They can resume their program as early as three days after surgery. Most are back in full swing by the end of a week. Pain is relieved in a majority of patients. Weightlifters are pleased that without the pain, they can quickly get back to their pre-operative level of lifting within a week or two. In fact, some even report exceeding their training weight once the pain is gone. Likewise, there are reports of manual laborers returning to full work duties. The turn around time is very short. Patients should be warned that there could be some problems. Abnormal motion of the AC joint can lead to a poor result. In such cases, pain is not relieved. There can be muscle injury, prolonged bleeding, infection, and fracture of the clavicle during the procedure. Smokers are at greater risk of poor wound healing and failed surgery.